Homepage Men Kurta Pajama Buy Traditional Dhoti Kurtas For Grooms At Nihal Fashions! Buy Traditional Dhoti Kurtas For Grooms At Nihal Fashions! The wedding season calls for amazing fashion trends. Grooms these days no longer want to get dressed in typical sherwanis. Along with Indo-western trends, men these days also prefer to wear Indian clothes. Dhoti kurta still remains a classic combination when it comes to Indian wear. Earlier, the combination of dhoti and kurta was thought of as monotonous but these days there are many unique styles in dhoti and kurta too. Dhoti kurta has been an integral part of Indian culture. This outfit combo is usually worn for weddings occasions and festivals. Coupled with style and comfort, dhotis and kurtas now come in several varieties. Right from different colour combinations to unique cuts, many elements are now added to this attire. Men have very few options in Indian outfits and kurta pajama still takes the centre stage. Initially, dhotis were only present in light tones but with time dhotis have transformed to a great extent. Grooms nowadays are ready to experiment with their clothes. Apart from the classic men’s kurta pyjama combo, dhoti kurta has made a huge comeback. Dhoti kurtas are now available in several fabrics and prints which makes them ideal for wedding occasions too. With correct styling and the right selection of colours, even dhoti kurtas can look impactful. Designers nowadays go for different prints and hues when it comes to curating a kurta. Based on the occasion, kurtas are designed! It is quite easy to style an Indian kurta. Check out the different dhoti kurta styles for grooms. Instead of opting for a typical sherwani, one can go for a sherwani kurta too. 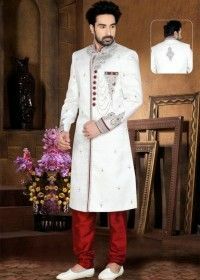 A sherwani kurta is short in length as compared to a usual sherwani. 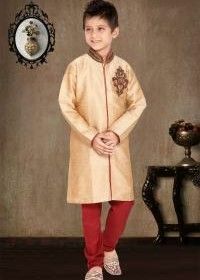 This sherwani kurta can be teamed up with a dhoti. Grooms who want to go for a royal look for their wedding can opt for this combination. Make sure you choose the right colours. Ditch the boring kurta pajama sets and instead go for this unique combo. An overcoat style kurta is formal looking which makes it perfect even for wedding receptions. Usually, this kurta style is worn with a churidar. Well, men having an eye for newness can combine this kurta with a dhoti too. Choose tones like dark blue, maroon, olive green, etc. for overcoat style kurtas. Additionally, you can go for different coloured dhotis like black, beige, etc. Indian outfits like these offer both style and comfort! Suit up with a Nehru Jacket! Nehru jacket kurtas are very much in trend these days because they look extremely sophisticated. Team up this kurta with a dhoti and make a mark. This combination also works well for grooms who are ready to experiment a bit. 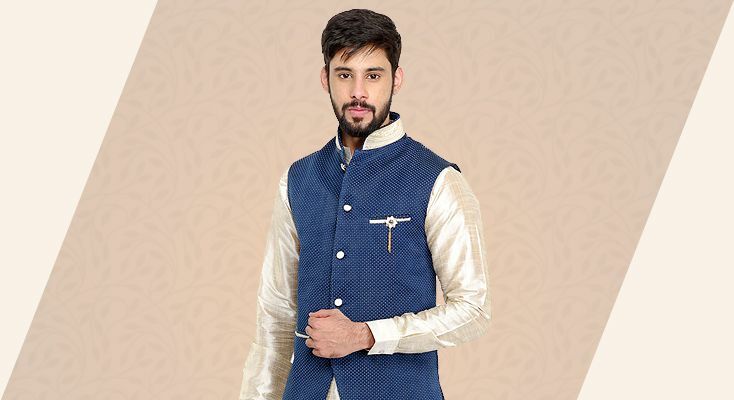 A Nehru jacket kurta is quite body-fit so make sure you are comfortable in the same. Indian clothing for men is usually quite simple but Nehru jackets need a good posture. Nehru jackets look best when they are simple so make sure you don’t go overboard with embellishments. Nehru jackets have always been in fashion because of their crisp look! Just like women have capes to add an element of oomph to their outfits, men can go for long jackets. Long jackets and kurtas teamed up with a dhoti give out an outstanding look. 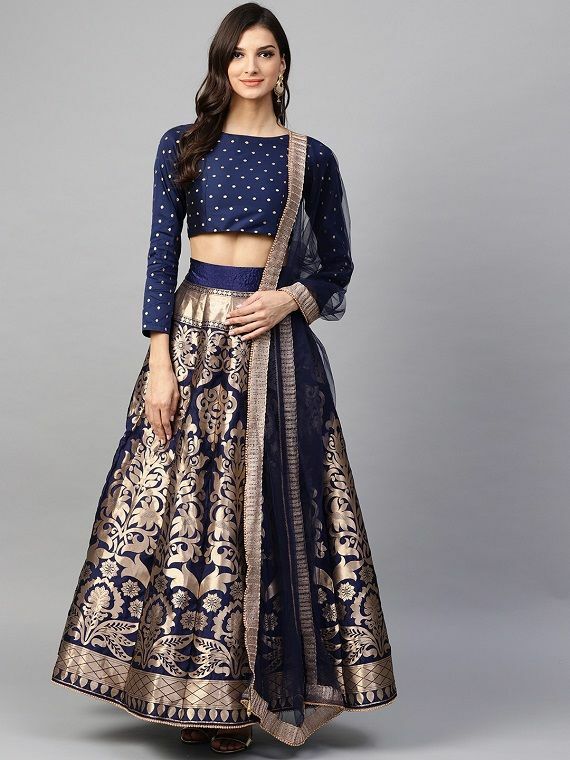 Perfect for weddings and sangeet ceremonies, this particular outfit is easy to carry too. The colour combination is of utmost importance here. Most of the times, Indian outfits for a groom are chosen in boring hues of yellow, red and green but these days you can select pastel shades too. See to it that the tones of kurta, jacket and dhoti are in sync. Styling is very important in Indian clothes. Men can either add accessories to their Indian outfits or simply go for uncommon patterns or designs. Apart from footwear, dupatta, finger rings, etc. there are several other aspects too which enhance the look of the outfit. Here are some key points you must remember when purchasing a men’s kurta pyjama or a dhoti kurta! Fitting is very important in Indian clothes. Make sure the outfit suits your body shape and is complementing your physique. Some Indian outfits are meant to be of a loose fit but some also need a defined body fit. See to it that the outfit suits your personality! Colours can have a great influence on the overall look of the outfit. Grooms can go for bright shades or opt for pastels as well. If you are someone who is good at experimenting then contrast hues can also work for you. If you are wearing a dhoti kurta then make sure the two blend correctly colour wise. These days colours like peach, bright pink, sky blue, olive green, etc. are quite in trend. Even dhotis are available in several colours like grey, beige, black, maroon, etc. Based on the kurta you can select the right colour for your dhoti. 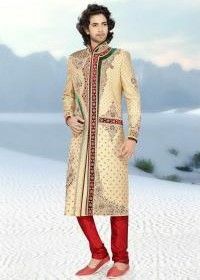 Indian outfits for grooms are heavy looking because they are either filled with embellishments or embroideries. When selecting Indian clothing also focus on its material. The fabric needs to be comfortable and should be able to hold the work too. Nowadays, Indian clothes are available in all fabrics which makes selection all the more easier. Also, don’t forget to consider the season when selecting a particular fabric. Visit the online fashion portal Nihal Fashions for latest dhoti kurta styles. This online fashion hub excels in all types of Indian outfits, be it dhoti kurta, kurta pajama, lehenga choli, traditional gowns, etc. 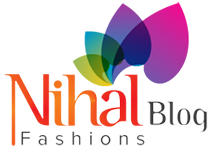 Nihal Fashions has exclusive designs for wedding wear too! Also, don’t forget to check their festive offers and discounts. Shopping online for Indian outfits is full of bliss because it is time-saving and convenient. 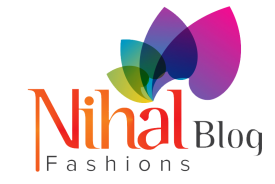 Revamp your wardrobe with trendy ethnic wear from Nihal Fashions.